Audubon Country Club Audubon Homes: JUST REDUCED $100,000. WOW. EXCEPTIONAL custom coastal estate provides 5 bedrooms, 6 full & 2 half baths, 2 dens, exercise room, very large covered lanai with outdoor kitchen & 3-car garage. The grand architecture includes a private entry wall & courtyard that opens to a gracious front door & foyer. Extraordinary volume & cathedral ceiling + 6 sets of French doors in the open living/dining rooms & the large family rm/kitchen make this home a standout among the beautiful homes in Audubon. This coastal/casual-living home has great natural light throughout. The chef-worthy kitchen opens to the family & breakfast rooms with 10 ft. sliders that pocket open to the lanai, outdoor kitchen & pool/spa. The incredible master wing offers his & hers baths + 2 dens + an exercise room. This outstanding home is well suited for family & friends & could accommodate an au pair or caregiver in private quarters. Two guest bedrooms w/private baths are upstairs, and two guest bedrooms and 1 & 1/2 baths are in the guest house -- easily converted to include kitchenette. This truly exceptional home will enhance any Buyer's Florida lifestyle. The best beaches, restaurants & shopping are minutes away. Audubon Country Club Audubon Homes: Your one in a million opportunity to own a custom built lakefront estate home, located on over a 1/2 an acre in the prestigious Audubon Country Club. The home is located at the end of a cul-de-sac, next to a protected preserve offering complete privacy. You enter the circle driveway to an impressive porte cochere as well as an over-sized air conditioned 3 car garage. The sprawling floor plan is brilliantly designed offering access to an enormous covered lanai that has a peaceful, secluded lake view w/ a massive 40 foot swimming pool/spa that can be seen from nearly every room in the home. Interior features include a double-sided keystone gas fireplace between the living & dining areas, granite counter tops, marble flooring, extensive crown molding, & wood cabinetry. The master suite is absolutely stunning offering over-sized his & her bathrooms, dressing area w/ huge custom closets. Above the garage is a private in-law suite complete with sitting room, kitchenette & bedroom. The home is fully hurricane protected. This home has many amazing architectural designs throughout that you have to see to truly appreciate. This home is a must see. Call for your private showing today. Audubon Country Club Audubon Homes: Superb curb appeal, fabulous double fairway golf + lake + stream views, and a NEW "AS IS" value price to accommodate updating, make this the perfect buy in Audubon Country Club in North Naples. With volume ceilings, large windows throughout and French doors leading to the lanai from all main rooms, the home is bright & airy & sophisticated. The large living & dining rooms are made for entertaining as are the open-plan kitchen & family room. The study has built-ins & large windows. The kitchen boasts a large island with cooktop & plenty of additional counter space/breakfast bar/desk. The large master bedroom suite has his-and-hers walk-in closets & a walk-through shower plus a jetted tub, and there are two en suite bedrooms & a powder room. For outdoor entertaining, there's an expansive lanai with generous-size pool/spa. The garage, with epoxy floors, accommodates two cars + a golf cart. This estate-lot home is a gem ready to shine. Audubon Country Club, which requires social or golf membership, is a sports & social paradise with golf, tennis, bocce, croquet & many social events & activities. 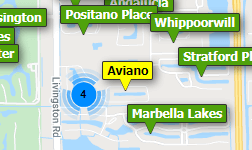 Audubon is in a prime location -- 5 minutes to 4 beaches, great shops & restaurants. Audubon Country Club Audubon Homes: Stunning custom home in Audubon Country Club with the finest finishes imaginable. Perfectly-located on an oversized lot on a peaceful cul-de-sac drive. Offers highly-coveted Southern exposure for optimal sun on the courtyard lanai with heated pool, spa & ample covered or open air space to enjoy the serene preserve. This home is newly designer-furnished & remodeled with upgrades galore. Delight in soaring 12-16 ft coffered cathedral ceilings, natural-stone & marble floors, whole house marble & granite counters, custom trim/woodwork & incredible natural light from the preserve-facing pocketing sliders. The exemplary chef's kitchen boasts the finest granite counters & backsplash, island with extra storage, custom hardwood cabinetry & all stainless steel appliances, many new. The master salon includes a sitting area, dual walk-in closets & spa-like ensuite bath with stunning walk-through shower & 6 ft jetted tub. Perfect for hosting out of town guests/family, with a private guesthouse with 1 bedroom, efficiency kitchen & loft, located across the courtyard. Audubon offers gated entry, championship golf course, tennis, bocce & newly-renovated clubhouse with dining & resort-style pool. Montclair Audubon Condos: This richly appointed, model-like 3 Bedroom, 3.5 Bath Montclair end-unit condo with enclosed 2-car garage has been completely renovated with high-end finishes and has brand new electric hurricane shutters. Amazing views from the large screened lanai showcase Audubon’s multiple lakes & golf course fairways and affords sunset views. With 2,578 a/c square feet and over 3,000 total square feet, this condo lives like a home. Features include quartz & granite counters, wood floors, crown molding and generous lighting & wall spaces to display artwork. The dining room has gorgeous built-in cabinets w/wet bar & wine cooler & opens to a living room w/fireplace. The well-appointed kitchen w/breakfast bar is open to the family room. The bedrooms have private baths & are very spacious. The large master bedroom offers an incredible master bath with dual sinks, tub, large shower, vanity & sleek custom closets. Audubon's Bermuda-style club house has undergone a renovation, with interior design by Kemble interiors, an award-winning Palm Beach/New York design firm. Audubon Country Club is located within two miles of some of the most beautiful beaches & easy access to the best shopping & restaurants. Audubon Country Club Audubon Land: MAJOR PRICE REDUCTION!!!! BEST LOT AVAILABLE IN WARWICK ESTATES!! LAST LAKEFRONT LOT AVAILABLE. DEVELOPER BUILDING SPEC HOMES ON THREE LOTS. ALMOST ALL SOLD OUT!!! THIS EXTRAORDINARY OVERSIZED LOT ON WARWICK WAY HAS THE LARGEST LAKE VIEW AVAILABLE IN WARWICK ESTATES IN AUDUBON. Audubon Country Club Audubon Homes: Located on a cul-de-sac in the prestigious Audubon Country Club, this home is ideally positioned to provide total privacy from neighbors & offers serene nature & preserve views. Spacious great room is flooded with natural light courtesy of wall-to-wall sliders & picturesque windows. Features: plantation shutters, 20’’ porcelain tile & white oak wood flooring, soaring ceilings, hurricane shutters throughout & seamless outdoor/indoor living with wall-to-wall sliders. The spacious dining area is an entertainer’s dream with an adjacent bright kitchen featuring an island with sink, stainless-steel appliances, bar area & breakfast nook with charming bay windows. Sizable master suite boasts large walk-in closet & spacious ensuite bath bathed in sunshine with dual sinks & a bonus office that could also serve as a guest room! Relax in the total peaceful ambience from your large pool deck with the wetlands & golf course as a backdrop. Audubon Amenities: gated entry, golf, tennis, bocce, recently renovated clubhouse with dining & resort-style pool & more. Ideally located, with every convenience nearby & 5-minutes from world-class beaches. Membership choice can be social or full golf level. Audubon Country Club Audubon Homes: Paradise beckons…The soothing sound of falling water first greets you as you enter this open concept residence nestled within the gated community of Audubon in North Naples, only 5-minutes to the beach. Take comfort in privacy, for not one neighbor can be seen, whether lounging in the expansive courtyard, taking a dip in the sizable lagoon-style pool/spa (which is one of the most gorgeous pools in Audubon), or relaxing on your back lanai overlooking the tranquil lake & protected preserve beyond. Home boasts all new hickory wood floors with beach washed finish. Light & bright, the kitchen has been fully updated. Seamless indoor/outdoor living courtesy of sliders gracing nearly every room. Cabana with ensuite bath serves as a vacation retreat for guests. Totally remodeled master suite with all new bath, raised double sinks, granite counters & walk-in shower. A spacious walkthrough his & hers closet with ample shelving & storage. New storm-resistant garage door. A separate air-conditioned room adjacent to entry provides extra storage or room for a golf cart. Amenities: Joe-Lee designed golf course, 8 Har-Tru tennis courts, bocce ball courts, newly renovated clubhouse & gated entry. Devon Green Audubon Homes: REDUCED $60,000 for this beautiful & updated home that offers a light-filled OPEN floor-plan with a new roof & nearly 3,000 A/C SF. The home has soaring ceilings and windows, 3 BD, w/3 & 1/2 updated BA, a den/loft & generously sized lanai w/pool & spa overlooking greenery + golf course. This home has been meticulously maintained -- completely move-in-ready. The dining room opens to a 2-story dramatic living room w/fireplace & has a butler's pantry w/2 beverage refrigerator drawers. The spacious family room has a built-in entertainment center & opens to a large kitchen & breakfast room, with sliders to the lanai & pool/spa. The first floor master bedroom & updated master bath are both spacious and inviting. The upstairs includes 2 guest bedrooms with private baths & a den/loft area that has great views of the golf course & a large lake beyond. The efficient Devon Green HOA has a very reasonable quarterly fee, which includes landscaping, exterior painting, roof cleaning & partial water bill coverage. Audubon is conveniently located minutes from several beaches, restaurants & shopping. Audubon has an 18-hole golf course, tennis & more. Social or golf membership required in Audubon. Devon Green Audubon Homes: Located on one of Devon Green’s premium locations in Audubon overlooking the lake and wide fairway, this home is move-in ready. Enjoy the perfect three-bedroom, three-and-a-half-bath home in fresh neutral colors. This home is nicely updated with wood floors in the master and guest bedrooms, granite countertops, comfort level commodes, new light fixtures, outdoor fan and lovely landscape lighting surrounding the house and enhancing the lush tropical vegetation as well as the pool, spa and lanai areas. The combination great room and dining room with bar have volume ceilings and plenty of room for entertaining with sliding glass doors convenient to the outdoor pool area. The master bedroom has a sitting area and a built out closet. The Devon Green Homeowners Association handles exterior maintenance, painting, roof maintenance and landscape maintenance. Audubon is conveniently located west of US-41 close to beaches, shopping and cultural activities. A delightful 35,000-square-foot clubhouse is full of activities for everyone. Members may own their own golf carts. Membership is required. NEW HVAC installed May 2017. Montclair Audubon Condos: C.14907 - Seller is motivated says Sell! Take advantage of this well priced opportunity to live in a beautifully appointed 3 bedroom plus den home in one of Naples premiere communities. Montclair is a small complex with only 36 units. There are 6 units to a building and just two on each floor. The spacious 2,528 sf open floor plan offers formal living and dining rooms, powder room plus three en-suite bedrooms with stunning golf course/lake views from a wrap around screened lanai. Other features include new a/c unit, porcelain tile in main areas, new carpeting in bedrooms, plantation shutters throughout, two car garage, electric shutters on lanai and impact resistant windows. A complete renovation of Audubon’s 35,000 sf clubhouse was completed in 2014 allowing you to enjoy eight Har-Tru tennis courts, Olympic size pool, two tournament rated croquet courts, formal & casual dining plus Audubon’s championship golf course. Audubon is west of US41 two miles to Gulf beaches, first class dinning, shopping and 30 minutes to RSW Airport. Devon Green Audubon Homes: BEST PRICE IN AUDUBON! OWNERS SAY SELL! BRING OFFERS! This home is priced at $167 per sq ft. Audubon's average is $264! With TLC updating/remodeling, make this home yours! Walk under the bougainvillea trellis & through the front door to this stately 3 BR/3.5 BA home. See the sun-filled 2 story living room with windows, high ceiling & FIREPLACE! Adjacent is the family room with open floor plan that includes the kitchen & casual dining. Formal dining room makes entertaining family & friends easy & fun! The best part is the spacious GROUND FLOOR MASTER SUITE offering privacy to owner & guests! Upstairs offers 2 bedrooms & 2 baths. With a golf course backdrop, lush landscaping surrounds the lanai with pool & spa. The Devon Green HOA maintains the home's landscaping, outside paint & roof clean-up. The remodeled Audubon Club offers dances, parties, lunches & dinners, cards, as well as tennis, bocce, croquet, water aerobics, fitness center, & trainers are available. Restaurants, shops, entertainment & churches are all close by. Ask how seller may contribute to required M’ship initiation fee: Full Golf $55k, Social $25k. Beach is just 2 miles - walk, bike or drive! Call today! Greenfield Court Audubon Homes: BRING ALL OFFER LOCATED AT THE END OF A QUIET DEAD END STREET IN NAPLES PREMIRE “Gated” COMMUNITY OF AUDUBON. This home offered at a perfect price-in a perfect community. Audubon Country Club is a gated, full amenity community west of 41 and very close to the beach and everything Naples offers. This 3 bedroom 2 bath single level home is located on a dead end street assuring privacy. Inside the home is a well thought out open floor plan. Double windows and tinted. Along with the three bedrooms and 2 baths comes a nice laundry area. The plus 2 car garage is over sized to accommodate your golf cart and still have plenty of storage room for other items we all collect.. A complete renovation of Audubon’s 35,000 sf clubhouse was completed in 2014 allowing you to enjoy eight Har-Tru tennis courts, Olympic size pool, two tournament rated croquet courts, formal & casual dining, plus, Audubon’s outstanding championship golf course. Audubon Country Club Audubon Land: Incredible offering at an unbelievable price. This magnificent residential lot is located west of Vanderbilt Drive behind the gates of Audubon Country Club's bayside neighborhood. Superb cut-de-sac location. With nearly an acre of buildable land, this pie shaped lot affords beautiful positioning of your new residence allowing a very flexible floor plan and complete privacy with coveted western exposure. There has never been a better time to wisely invest in this remarkable offering. As a certified Audubon cooperative sanctuary, Audubon Country Club is situated on 771 acres of lush tropical foliage, the only golf course gated community west of US 41 within minutes of the Gulf of Mexico. Audubon Country Club Audubon Land: Lowest priced lot in all of Audubon! Located on 0.74 acres the 130' road frontage great for circular driveway. The preserve to left of this lot has been approved for a nature trail boardwalk leading out to the bay. Meticulously planned with the dual purposes of preservation and prestige, the Audubon Country Club of Naples amounts to an extraordinary 770 acre residential community. 274 acres of the land contained within the Audubon Country Club, which encompasses sensitive coastal areas and estuaries, will never be developed. It will instead remain as a protected wildlife sanctuary. Membership in the golf club is limited to just 350, making the wait for a tee-time an unfamiliar notion here. The 36,000 square foot clubhouse is not only spacious buy elegant. Only Audubon residents may join and partake in the myriad activities. The tennis program is quite active, with 8 lighted Har-Tru courts and a delightful Courtside Café eatery. Heated and welcoming, the 25-meter pool is a perfect venue for water aerobics and lane swimming. Unique among most area country clubs are the Audubon Club’s championship croquet courts.